…Higgs Boson scientists given Nobel, but it is in "question"…!!! … crashing protons does not make sense in logic as to making anything…! HIIGGS BOSON Scientist win Nobel…! THOUGH I BELIEVE IN MOST SCIENCE AND LABORATORY STUDIES! I find it hard to prove Higgs Boson as a “elusive” God Particle…! 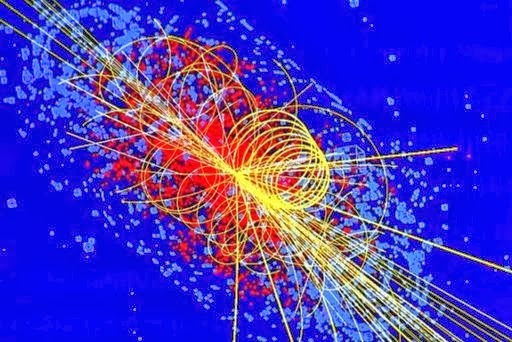 They allege they have detected and photographed remnants of Higgs Boson after the crashing of Protons…! • The Higgs Field. Explains that the Higgs Field could be a Newtonian Field in Spacetime. The Higgs Mechanism is often credited by academic Physicists with explaining the “origin” or “genesis” of mass. But there is some doubt as to whether the Higgs mechanism provides sufficient insight into the actual nature of mass. As Max Jammer puts it, “if a process generates mass, it may reasonably be expected to provide information about the nature of what it generates as well”. In other words, the Higgs mechanism doesn’t contribute to our understanding of the nature of mass. To date, the Higgs Boson has been discovered but not its associated field, the Higgs Field. So, the challenge now for the Higgs Boson Teams is to prove that the Higgs Field also exists. Replacing the Higgs Field by a “Newtonian Field in spacetime created by the closed volumes of the particles or atoms” solves the problem of its controversial existence and explains a large part of Modern Physics. • a/ The Higgs Mechanism. The figure (a) below shows that when the star moves through the party, she attracts the people closest to her. This increases her resistance to movement. In other words, an external observer could think that she aquires mass, just like a particle moving through the Higgs Field. This scheme is called the “Higgs Mechanism”. • b/ The “Spacetime Model” (i.e. the theory presented in this website). The basic principle is identical to the Higgs Mechanism. The closed volumes of the four particles in orange curve spacetime. In the center, all these curvatures will be added to the initial curvature of spacetime. As a result, this density of spacetime will increase the resistance to movement of the blue particle. An external observer could think that the blue particle aquires mass, just like in the Higgs Mechanism. As we see, the Higgs Mechanism is identical to the Spacetime Model. The only difference is the nature of the medium. In the Higgs Theory, the medium is a Higgs Field coming from the energy of a vacuum, whereas in the theory proposed here, it is simply spacetime, a medium that all physicists know since the 1910’s. • Either the Higgs Field is validated by experimentations. In such a case, the explanation of mass and gravity presented in this website will be dropped. • Either the Higgs Field is not demonstrated by experimentations. In such a case, the Higgs Theory must be dropped. A great Laboratory has chosen to plan an experimentation to validate (or not) the theory presented here. This experiment will measure the mass of an electron during seven days. Since the density of spacetime is modified each day due to influence of the moon, the mass of the electron should varies accordingly. However, these variations are infinitesimal (< 1 ppm). If successful, this experiment would validate the Spacetime Model. …RATHER the Space Time Model is more logical to pure logic…! …I vote for the more logic, SPACETIME theory…! Less complicated and obvious…! …I WOULD SUGGEST THAT CRASHING OF PROTONS PRODUCES ENERGY AND DESTRUCTION OF “MATTER”…! Not it’s creation…! …BROS. GIVE ME THE NOBEL, for suggesting, we have to make electrons, protons, and sub-atomic particles, TO KNOW HOW TO MAKE MATTER AND ENERGY…! BLaaaaaaaaa…! …use the accelerator to MAKE MATTER OR AN ATOMIC PARTICLE…! I THINK THEY ARE SHOOTING IN THE DARK…! ← …to the Bible God followers and believers, Governments and Academia Theology…! To Elizabeth 2 and "cute _Heirs_" and Governor Generals, Presidents of USA, etc…! Sleep in peace, rest asured, Jesus is near at all times for you all…!